Ian Gillan has revealed Deep Purple are holed up in their Portugal studio writing material for what will be their 20th studio album. And he says they’re having a great time despite the “no frills” lifestyle. 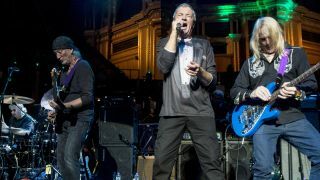 Gillan tells Zeitung: “The whole band is here. We have a studio in the Algarve where we’re working on new songs. Purple last month launched a deluxe edition of classic live set Made In Japan – but Gillan admits he has no interest in listening to it. “I don’t like live albums especially,” he says. “But I know the importance and significance of Made In Japan. The tour, 42 years ago, blew me away. It was my first time in a country where I felt fundamental differences in mentality to Europe. And despite album work, the singer says it’s still all about playing live for him – to the extent that he doesn’t see himself ever stopping. “I can’t imagine not being on stage,” he states. “When I was a teenager, I went to a Cliff Bennett concert and I released I wanted to be where he was. The interaction with the audience, and even more important for me, with the musicians – that’s pure magic. Purple’s last studio album, Now What? !, was launched last year.